Ominous skies greeted the riders as they rolled out of Omagh on Stage 3, but the constant rain and wind didn’t stop them serving up an afternoon of quality racing. With a review of groups and time gaps the limit group minus the three GC contenders rolled out with a three-minute gap on the scratch group. 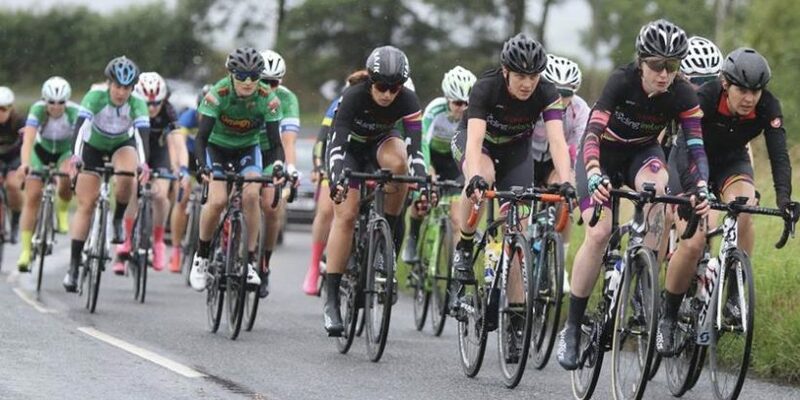 Early on Lyndsey Bryce from Cycling Leinster was to the fore forcing the pace and hoping to keep the scratch group at bay, but they weren’t making the same mistake again, and as the race approached Carrickmore for the first time the gap was down to 1 minute and 20 Seconds. The first time over Mallowee was to really shake up the race up, with seven women Frances Shanahan (West Cork), Sandra Howard (Orwell), Claire Ludlow (Ardee), Ellie Mc Ardle (Cycling Ulster), Hannah Tilly (Women’s Commission), Ciara Ni Fhlathartaigh (Orwell Wheelers) and Lyndsey Bryce forging clear. This wasn’t to last long as the scratch group very quickly closed them down, and as they approached Creggan Cross-Roads a group of about 17 riders held a ten second lead over the chase group of 11 riders. These groups were soon together along the exposed Cookstown Road before turning and heading to Carrickmore for a second time. Through Mullaslin , Aisling Flanagan was to attempt a solo effort and managed to eek out a 25 second advantage as the race approached Carrickmore, her effort was in vain as the group reeled her in on the climb to the village. Through Carrickmore for a second time , and pressure was applied at the front – and the group was quickly whittled down to 18 riders as they approached Creggan. Clodagh Gallagher Won the Sprint to the line from Lara Gillespie with Clodagh’s Ulster team mate Laura Campbell in third place .